Jeremy Corbyn is seeking an "urgent meeting" with Jewish leaders to discuss their concerns about the rise of anti-Semitism in the Labour Party. Jewish groups have accused the Labour leader of not doing enough to tackle it and in a strongly-worded open letter told him "enough is enough". Protesters have gathered outside Parliament demanding action. 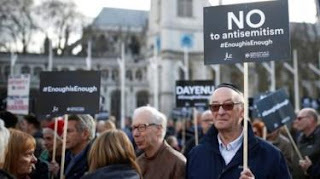 MP Luciana Berger told the crowd anti-Semitism had become "more commonplace, conspicuous and corrosive". And her colleague Wes Streeting said the time was over for "mealy-mouthed words" from Mr Corbyn and action was needed to drain the "cesspit" of anti-Semitism. Mr Corbyn repeated his apology to Jewish people in a letter to Jewish leaders ahead of the protest. In it, he says: "I recognise that anti-Semitism has surfaced within the Labour Party, and has too often been dismissed as simply a matter of a few bad apples.